The current article focused on explaining the purpose of the SPF record and, how does the SPF record enable us to prevent a scenario in which hostile elements, could send E-mail on our behalf. The next article – Implementing SPF record | Part 8#17 , focus on the “technical side” of the SPF record such as – the structure of SPF record, the way that we create SPF record, what is the required syntax for the SPF record in Office 365 environment + Mix mail environment, how to verify the existence of SPF record and so on. Why do I need to use SPF record? How does the SPF record prevent a spoofing scenario? 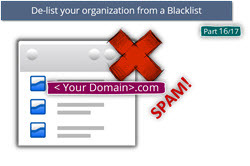 Try to prevent a scenario, in which spammer will send E-mails using our domain name (a specific organization E-mail address) by using his mail server. 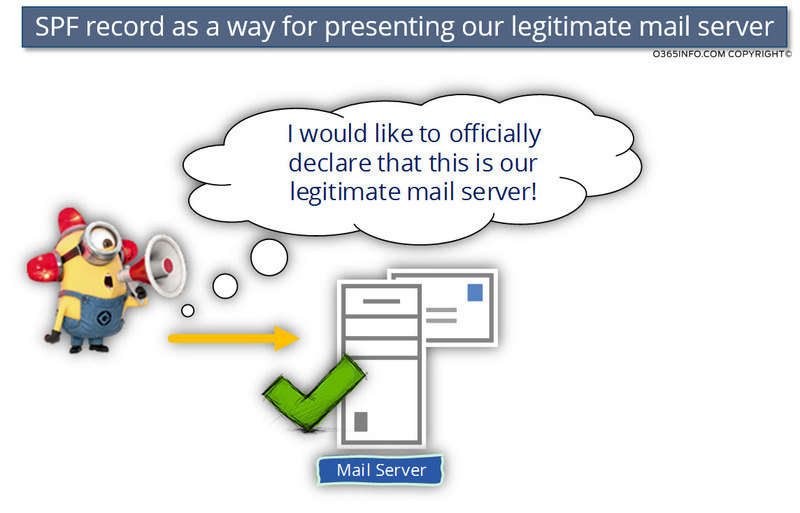 In other words: a scenario in which the spammer’s mail server is introduced himself as “our legitimate mail server”. 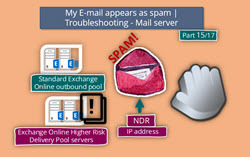 Preventing a scenario, in which a destination mail server will block E-mail that sent from our organization or “stamp” our organization mail with a high spam score level because a spammer is “distributing E-mail” using our organization user’s identity (using an E-mail address of our recipient organization). Issues that relate to SPF record. Lack of SPF record – a typical scenario, in which the organization doesn’t use an SPF record. The main reason is – lack of awareness to the big impertinence of using SPF records. Miss configured SPF record – an existing SPF record that was configured with incorrect syntax or doesn’t include the “full information” about all the mail server that represents the particular organization. 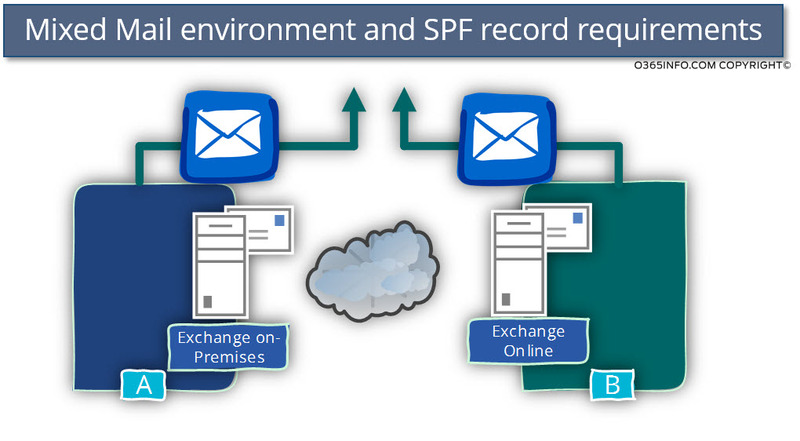 The use of SPF record is critical in a modern mail environment because SPF record enables us to set the level of “reliability” of an E-mail message that sent “from our organization” meaning: E-mail message sent from our legitimate mail server. The purpose of the SPF record is to enable organizations to publicly “declare” who are the mail servers, which are authorized to send mail on behalf of the organization (for a particular domain name). The destination mail server, which accepts E-mail message that includes our domain name (E-mail address with our domain name), can verify if the mail server that “deliver” the E-mail is entitled or, authorized to represent the specific domain name. 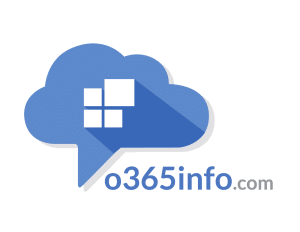 The destination mail server verifies this information by looking for at the organization SPF record, which should include a list of all of the authorized mail servers that represent the particular domain name. E-mail or, “block” the sending mail server. A scenario in which we don’t use SPF record or, a situation in which we sent mail by using a mail server that doesn’t appear on the SPF record that represents our domain name, could lead to a significant reduction in the “reliability grade” of E-mail that is sent by our organization users. In other words: an outcome in which our organization E-mail identified as spam \ junk mail. 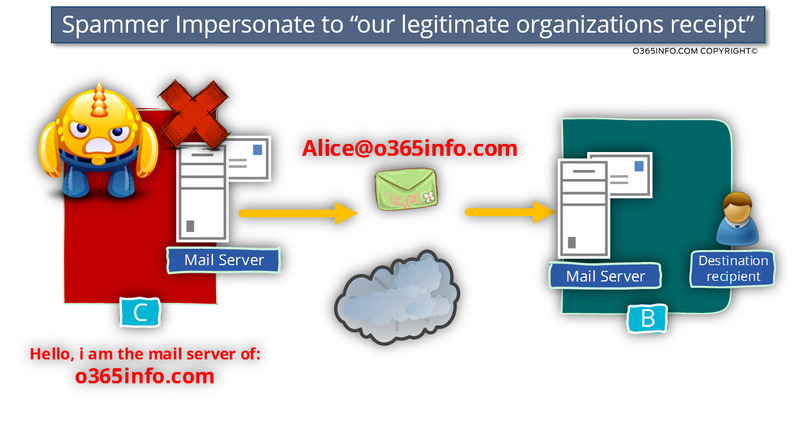 In a modern mail environment the scenario of “spoofing” is very common and very popular. 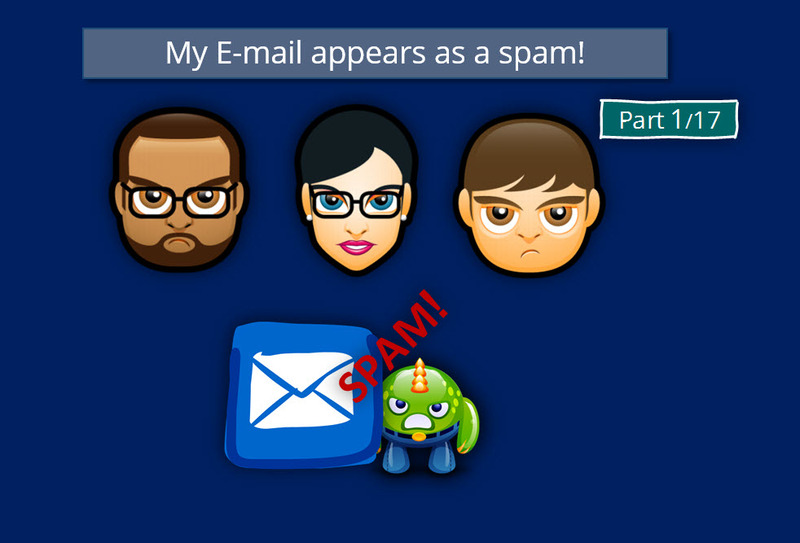 The reality is a little different and many times, hostile elements such as spammers, use the primary SMTP option for “presenting themselves” as some else (impersonation). An E-mail message to a recipient who hosted on mail server B, mail server A, present himself as the representative of the source recipient. By default, server B (the destination server) is supposed to believe to server A ( the belief that he is the true representative of the source recipient). 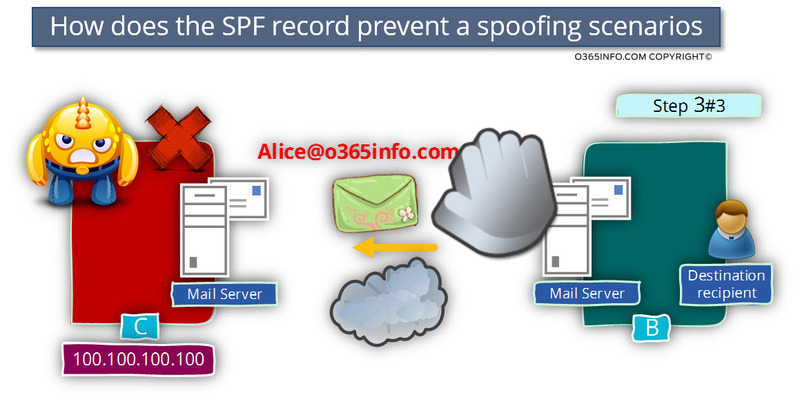 The SPF record was created for preventing a scenario in which spammer, fake his identity and, pretend to be the “legitimate mail server” of a particular organization. Q1: What is SPF stand for? Q2: How does the SPF record is implemented? A2: By publishing a TXT record in our public DNS that includes pre-defined structure + information about the mail server that is authorized and “approved” to send E-mail on behalf of our organization. Q3: What is the information that included in the SPF record? A3: The SPF record contains information about the mail server names or IP address that represents a particular organization (domain name) and can send an E-mail on behalf of the organization. Note – the SPF record syntax includes additional options for “pointing out” the legitimate mail server, such as using the MX or the A record option. For example, when using the MX option in the SPF record, the meaning is that all the mail servers who appear “under” the MX record of a specific domain name, considers as “authorized” mail server that can send E-mail on behalf of the particular domain. 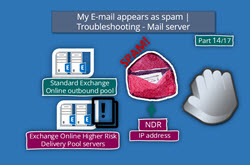 In the following diagram, we can see that the spammer’s mail server connects the destination mail server and asks him to forward email messages to the target recipient. Step 2: Destination mail server, check SPF record. Step 3: Destination mail rejects the E-mail message. 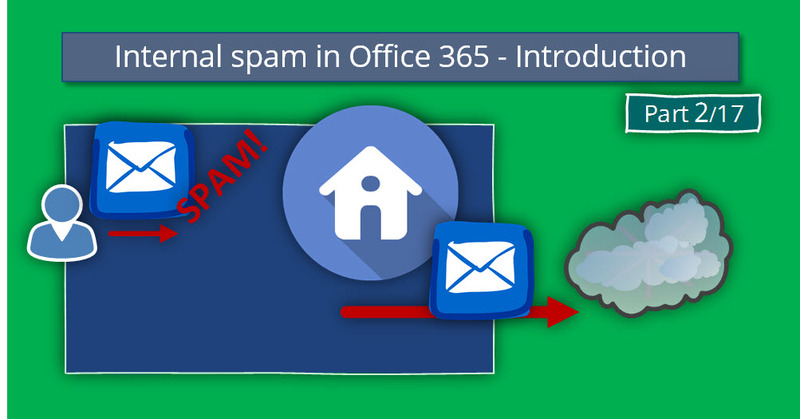 Because the SPF record for the domain – o365info.com doesn’t include this IP address; the mail server will reject the E-mail message from the spammer’s mail server. Important note – the “real world” is a little more complicated. In reality, there could be many other scenarios. For example: in case that the “destination mail server” is not configured to check the existence of SPF record, he will accept the E-mail message that was sent by the spammer. Another possible scenario could be a situation in which the “destination mail server” will agree to accept the E-mail, although the IP address of the “source mail server” (the spammer’s mail server) doesn’t appear in the SPF record. In this case te mail server “stamp” the E-mail message as a “problematic” or dangerous E-mail message. Q: What are a possible scenario of “problems” that relates to SPF record? Lack of SPF record – A scenario in which the organization doesn’t use SPF record. More than one SPF records – a common mistake, in which the DNS includes two or more SPF records. The outcome is: “unknown results”. Some of the mail server will relate only to one SPF record and some mail server, will refuse to accept mail because the SPF record not configured correctly. SPF record that set improperly. 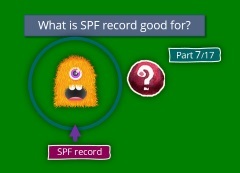 SPF record based on very strict “syntax rules” that dictate how to “construct” the SPF record. In some cases, the SPF record includes a syntax error. In this case, we are dealing again with the realm of: “unknown results”. SPF record that doesn’t include information about all the organization’s mail servers. Any of this “issues”, could lead to a scenario in which external mail server will block mail that sent by a user’s from our organization (users whom their E-mail address includes our public domain name). 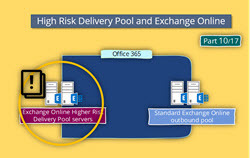 An example of a scenario: “SPF record that doesn’t include information about all the organization’s mail servers” could be: Hybrid environment, that is based on two separated mail infrastructures: the Office 365 mail infrastructure (Exchange Online) and the Exchange on-Premises mail infrastructure. 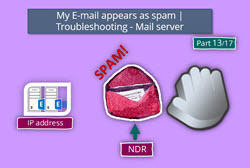 In this scenario, an E-mail message could be sent from the booth of this mail infrastructure (depend on the physical location of the user mailbox). In a scenario of: “two separate mail infrastructures”, the SPF should contain “pointers” to the separated mail infrastructure. In simple words: the SPF record should “declare” that E-mail that sent by the Exchange Online mail servers + mail that sent from the Exchange on-Premises mail server\s consider as a legitimate mail. In case that the SPF record value that we have configured doesn’t include information about the Exchange on-Premises server. 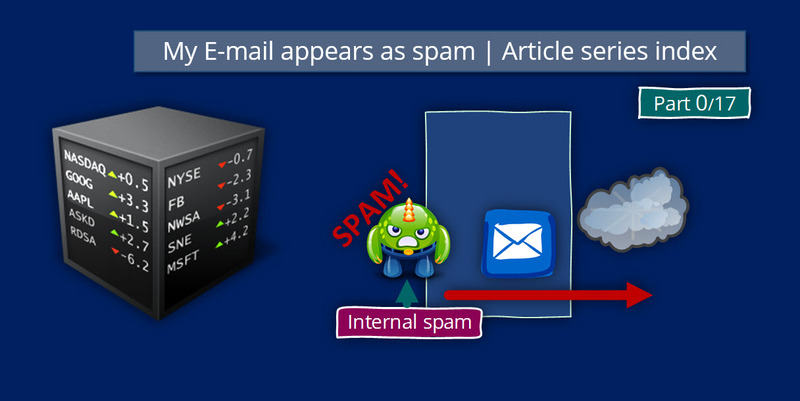 Each E-mail that will be sent by the Exchange on-Premises server has the Potential to be identified as spam \ junk mail. Q: In a scenario of a problem in SPF record, what are the possible “responses” of the target mail server? A: It’s important to emphasize that in a scenario of: “problems that relate to SPF record,” the “response” from the destination mail server, cannot be predictable. The reason is that each mail server, use or implement a different mail security policy. Some of the mail servers are more “forgiving” to a scenario of luck (or a problem) of SPF record and, some of the mail servers are stricter. The current article focused on explaining the purpose of the SPF record and, how does the SPF record enable us to prevent a scenario in which hostile elements, could send E-mail on our behalf.The next article – Implementing SPF record | Part 8#17 , focus on the “technical side” of the SPF record such as – the structure of SPF record, the way that we create SPF record, what is the required syntax for the SPF record in Office 365 environment + Mix mail environment, how to verify the existence of SPF record and so on.